It's the twenty-fifth century, and advances in technology have redefined life itself. A person's consciousness can now be stored in the brain and downloaded into a new body [or "sleeve"], making death nothing more than a minor blip on a screen. Onetime U.N. Envoy Takeshi Kovacs has been killed before, but his last death was particularly painful. Resleeved into a body in Bay City [formerly San Francisco], Kovacs is thrown into the dark heart of a shady, far-reaching conspiracy that is vicious even by the standards of a society that treats existence as something that can be bought and sold. For Kovacs, the shell that blew a hole in his chest was only the beginning. Altered Carbon is a noir mystery set in the future. In this future, the human mind can be saved and downloaded into a new body. Kovacs is an envoy (a private investigator amongst other things). He is hired by Laurens Bancroft who is a billionaire and has been alive for hundreds of years (in new bodies). Bancroft was murdered and wants Kovacs to figure out who murdered him. Kovacs very quickly finds himself pulled into the worst parts of Bay City and a dark conspiracy. I am a huge fan of noir and crime movies. When my husband is out of town for conferences, I will watch a stack of mysteries such as Chinatown, The Usual Suspects, and The Godfather Parts I & II. Although I am a big fan of crime movies, I have not read very many crime and noir novels. I am not sure why that is, because I have enjoyed many of the mystery novels that I have read. Anyway, I was quite excited to pick up Altered Carbon after reading the book blurb. I was immediately pulled into the story. I found the world building and the mystery to be quite interesting. 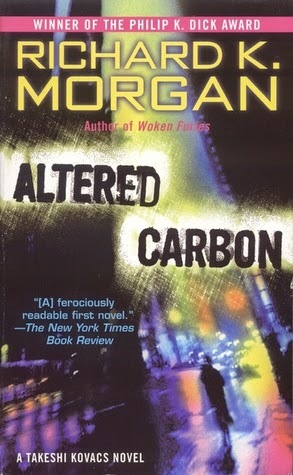 Although I am used to my noir stories being set in the past, Altered Carbon really had that noir-feel even though the novel is set in the future. Altered Carbon hit all the classic noir needs including a dark conspiracy, a femme fatal, and a cynical detective. In addition to the well-written noir-feel, I was really intrigued by the SF motifs. I liked the idea that people could be downloaded into new bodies all the time and that the very wealthy had multiple clones of themselves at the ready if anything should befall them. I know that "re-sleeving" is a fairly common trope in SF literature; however, it felt interesting and perfect for this story. It didn't feel like a gimmick to me. The mystery itself was quite strong and held up well throughout the story. The characters were well-written, although I wouldn't classify them as completely three-dimensional. I don't think this is a major problem though, because in mystery stories, I feel that the characters (outside of the detective-protagonist) are usually a bit flat. My one complaint with the novel is that it felt a bit long. About halfway through the novel, I started to get ansty. I just wanted to get to the climax already. I wish that Morgan had gotten to his ending a bit quicker or possibly tightened the writing a bit more in the middle. I found my mind wandering when I realized that I had another 200 pages to go with the story. Overall, I enjoyed Altered Carbon. I think a SF or noir mystery fan will enjoy this book. I am certainly glad that I read it, even though I felt it was a bit long at times.